Cape Clear Island, West Cork, Ireland. Irish Time. Short item on Storytelling Festival. Read here. Irish Examiner, General interest article on the Island. Read here. Southern Star, Nice article on excellent talks by Leo Enright on Islands, including Cape Clear on Space. Read here. The Journal .ie - Interesting article on songwriter Marty Ryan, visiting and composing songs about Islands, including Cape Clear. Southern Star - Article on Aonru production to be screened in Club on 3 May. Read here. Irish Times - Article by Ann Marie Hourihan on Betty Purcells new book which make some outlandish claims regarding the wind energy system on Cape Clear Island. Read here. Irish Examiner, Article by Eoin English on Titanic Beacons, including Cape Clear, Read here. 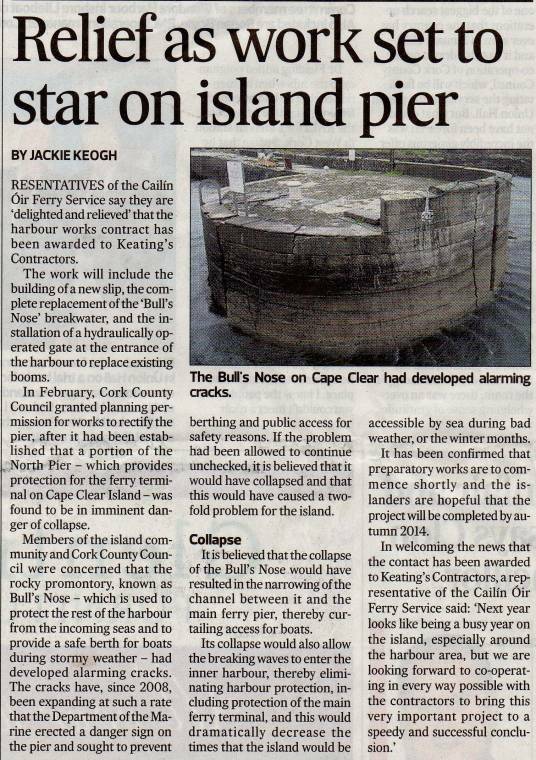 Southern Daliy Echo, Article on West Cork including Cape Clear. Read Here. Whales Online - Article on Tim Regan, from Cape Clear Island on his 100th birthday. University Observer Online - Article on Cape Clear Island in University College Dublin Magazine. RTE 2 - Dramatic Account of recent rescue at Fastnet Rock, our own vessel, Dún an Óir assisted in the search. Discover Ireland Website - Forthcoming Open Islands Weekend. Amber Blaire, Whoofer - Blog of her recent stay on Cape Clear Island. Cape Clear Hostel - Journey Planner. Afloat - Cape Clear Ferry Service Award. Report in Afloat regarding Baltimore Lifeboat call outs. Report on IWDG website on a super whale watching weekend on Cape Clear Island. Southern Star Article regarding availability of petrel for seafarers on Cape Clear Island. Blog entitled "Weekend in Heaven"
In your pocket, details of wildlife courses available on Cape Clear Island. Sea Kayaking article referring to abundance of cetaceans around Cape Clear Island. Web master can vouch for this from personal experience. Read article here. Southern Star about launch of new service. Baltimore and the islands brochure. Reporting on 50th Anniversary celebrations of Cape Clear Bird Observatory. Read article here. Reporting of Maureen O'Sullivan TD's triumphant visit to Cape Clear Island following her successful election 4th July 2009. Read Article here. Reporting on walking talking tour of Baltimore and Cape Clear Island. The tour on Cape Clear Island was provided by the Cailín Oír ferry service. Read article here. Article in German Lifestyle webpage published in May 2009. Web blog on Cape Clear and Sherkin Islands. Reporting on the launch of the Cailín Oír ferry service between Baltimore and Cape Clear Island in June 2007. Click on image or here to see full article. Southern Star Article on Launch of Cailin Óir Service. Article on Niamh Ni Drisceoil, Cailin Óir crew member. Click on image or here to see full article. St Marys Euxton, Fr Dan Cadogans Diamond Jubilee. About Conchubhar O Drisceoil, much loved skipper of the Cape Clear Island ferry by Eoghan Harris. Click here to see article. History of Atlantic Cables including Cape Clear Island Telegraph Station. How the Cape Clear International Storytelling Festival got Started by Chuck Kruger.